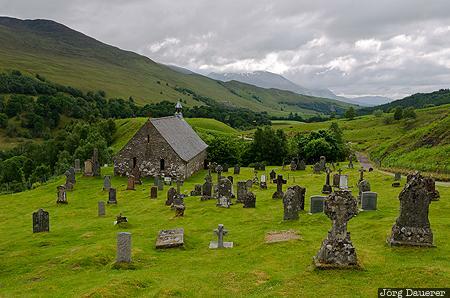 The small church Cille Choirill near Roy Bridge and the surrounding ancient burial ground in front of the green hills of Scotland below a cloudy sky. Roy Bridge is in Scotland, United Kingdom. This photo was taken in the afternoon of a cloudy day in June of 2013. This photo was taken with a digital camera.